For the library of Trinity College, Cambridge, see Wren Library. The Library of Trinity College Dublin (Irish: Leabharlann Choláiste na Tríonóide) serves Trinity College and the University of Dublin. It is a legal deposit or "copyright library", which means that publishers in Ireland must deposit a copy of all their publications there, free of charge. It is also the only Irish library to hold such rights for the United Kingdom. The Library is the permanent home to the Brian Boru harp which is a national symbol of Ireland, a copy of 1916 Proclamation of the Irish Republic, and the Book of Kells. Two of the four volumes of the Book of Kells are on public display, one opened to a major decorated page and the other to a typical page of text. The volumes and pages shown are regularly changed. Members of the University of Dublin also have access to the libraries of Tallaght Hospital and the Irish School of Ecumenics, Milltown. Early Printed Books and Special Collections. The Berkeley Library, in Fellows' Square. Designed by Paul Koralek of ABK Architects, an imposing Brutalist structure opened in 1967. The Lecky Library, attached to the Arts Building. Also designed by ABK, officially opened in 1978. The Ussher Library, overlooking College Park. Designed by McCullough Mulvin Architects, officially opened in 2003. The Preservation and Conservation Department. The Hamilton Science and Engineering Library, located within the Hamilton Building. The 1937 Reading Room (for postgraduate use). The John Stearne Medical Library (JSML), housed at St James's Hospital. Further materials are held in storage in Stacks, either in closed access within College or at a book depository in the Dublin suburb of Santry. The Library began with the founding of Trinity College in 1592. In 1661, Henry Jones presented it with the Book of Kells, its most famous manuscript. James Ussher (1625–56), Archbishop of Armagh, whose most important works were "Veterum Epistolarum Hibernicarum Sylloge" (1632) and "Brittanicarum Ecclesiarum Antiquitates" (1639), left his valuable library, comprising several thousand printed books and manuscripts, to the Library. His complete works were published by the Library in twenty-four volumes. In 1801, the Library was given legal deposit rights, making it the only library in Ireland to have such rights for the United Kingdom at that time. Many works are now being received electronically rather than in print under new UK regulations which came into force in April 2013. The 65-metre-long (213 ft) main chamber of the Old Library, the Long Room, was built between 1712 and 1732 and houses 200,000 of the Library's oldest books. Initially, The Long Room had a flat ceiling, shelving for books only on the lower level, and an open gallery. By the 1850s the room had to be expanded as the shelves were filled due to the fact that the Library had been given permission to obtain a free copy of every book that had been published in Ireland and Britain. In 1860, The Long Room's roof was raised to accommodate an upper gallery. The Long Room is lined with marble busts. The marble bust collection was formed when 14 busts from the sculptor Peter Scheemakers were acquired by the college. Many of the busts are of great philosophers, writers, and men who supported the college. The most outstanding bust in the collection is of the writer Jonathan Swift, created by Louis François Roubiliac. The Jedi archives of the Jedi Temple in the movie Star Wars: Episode II – Attack of the Clones bear a startling resemblance to the Long Room of the Trinity College Library. This resemblance resulted in controversy as permission had not been sought to use the building's likeness in the film. 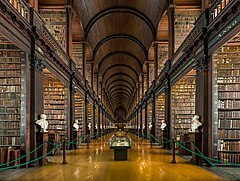 However, Lucasfilm denied that the Long Room was the basis for the Jedi archives, and officials from Trinity College Library decided not to take any legal action. ^ "University and College Officers - University and Professors, Associate Professors, Lecturers and other Officers". College Calendar, Trinity College Dublin (PDF). 2008. p. B117. Archived from the original (PDF) on 7 June 2011. ^ a b "Legal Deposit (Copyright Libraries)". Trinity College Dublin. Retrieved 16 November 2018. ^ "Book of Kells - The Old Library & the Book of Kells Exhibition : Trinity College Dublin, The University of Dublin, Ireland". Tcd.ie. 2014-12-04. Archived from the original on 15 March 2015. Retrieved 2015-03-09. ^ a b "History of the Library". Tcd.ie. Retrieved 28 January 2013. ^ "Electronic Legal Deposit (UK) - The Library of Trinity College Dublin - Trinity College Dublin". www.tcd.ie. Retrieved 2019-02-26. ^ a b c "The Long Room". Tcd.ie. Retrieved 20 April 2017. ^ Williams, Eoghan (29 September 2002). "Trinity to strike back at return of the Jedi". The Irish Independent. Retrieved 30 July 2015. ^ "Jedi Archives Clones Long Room, Trinity Attacks". Archiseek. Retrieved 30 July 2015. Wikimedia Commons has media related to Trinity College Library. This page was last edited on 10 March 2019, at 09:36 (UTC).